“Rose was the #1 volleyball and basketball recruit in Texas and is one of the finest and most talented athletes that has ever come from the Lone Star State. When Rose arrived at Houston, she had not played any junior club volleyball, and she was a tall, lanky, young aspiring athlete not realizing the Olympic potential that she possessed. It was her timid personality and her family background that I was most impressed with prior to recruiting her. Her willingness not only to accept our structured college program, but also to support the disciplined training that was needed to get her as well as her teammates to the next level. Rose excelled in every position that I trained beyond the level of any of the exceptional athletes that I have ever coached. She was so talented that training her as a setter/hitter was unheard of at that time. She was an exceptional setter and outstanding hitter for four years of collegiate competition. Rose was also by far one of the most exciting players I had the pleasure and honor to coach in my collegiate coaching career. In addition, Rose has become not only an outstanding coach, but also one of the best trainers in the game. She has transferred her love of the game to many aspiring young ladies during her summer camp programs and her junior club program. 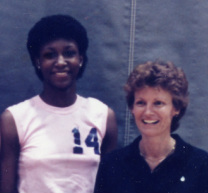 I am humbled to have been part of her volleyball career.” Head Coach, Ruth N. Nelson (quote from UH Hall of Honor 2012). “I had the privilege to work with Rose while she was a member of the 1984 USA Olympic Team and later, in 1991, when she joined the Daiei club team in Japan. Rose was one of those rare athletes whom God blessed with the physical and mental attributes a winner should possess. She was quick; she was skillful, and she was composed and positive under pressure. Rose learned and improved fast and she made everything look so easy and natural. It was a special sight to see Rose play. She looked graceful, poetic and yet fearsome and powerful. Rose’s tremendous competitive spirit coupled by an uncompromising striving to win made her one of the greatest and most domineering volleyball players I have ever coached or seen in action. 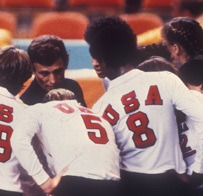 I was lucky to have Rose on my teams.” Head Coach 1984 USA Women's Olympic Silver Medal Team, Dr. Arie Selinger (quote from UH Hall of Honor 2012).